Mechanized sieve for separating mash into fine and coarse fractions (photo credit: ILRI/Iheanacho Okike). With 60% of the world’s arable land, Africa has the potential to not only feed itself, but also to become a major food exporter. 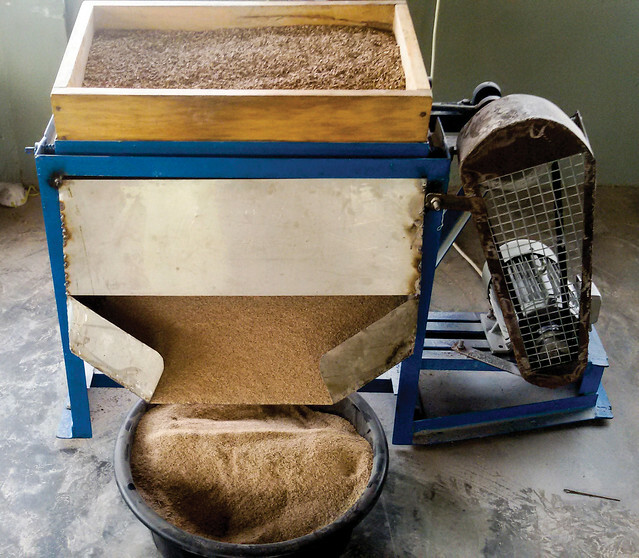 This enormous potential was demonstrated in an innovation by CGIAR scientists—processing cassava peels into animal feed—that was one of the many innovative technologies recognized at the Global Forum for Innovations in Agriculture (GFIA), Africa edition, held in Durban, South Africa on 1-2 December 2015. Participants at GFIA Africa explored innovative agricultural solutions coming from the continent and beyond that are enabling farmers, large and small, to create agribusinesses and contribute to wider economic prosperity. The forum brought together public decision-makers, private sector champions and civil society leaders to discuss what has been achieved through innovative technologies and approaches and how to scale up innovations. Unlocking this potential will require that Africa’s agriculture leapfrog traditional development challenges and leverage sustainable and inclusive agriculture as a driver for economic prosperity and global trade. In 2015, CGIAR scientists harnessed one such technology. They developed a low-tech way of transforming wet cassava peels into high quality, safe and hygienic feed ingredients within eight hours, producing one tonne of high quality cassava peel (HQCP) mash from three tonnes of wet peels. Speaking on the second day of GFIA Africa, animal scientist at the International Livestock Research Institute (ILRI), Anandan Samireddypalle—based in Ibadan, Nigeria—explained the simple process. He explained how 98% of Nigeria’s cassava peels annually are wasted due to constraints associated with drying and concerns about safety of use, particularly hydrocyanide- and mycotoxins-related food poisoning. Drying peels outside, practically impossible during the rainy season, takes two-three days otherwise, Samireddypalle continued. Consequently, peels are left to rot in heaps or set on fire—both polluting the nearby air, soil and groundwater and wasting a potential feed resource. With the right investment in scaling up, Africa’s estimated 50 million tonnes of cassava peel waste per year could generate at least 15 million tonnes of HQCP, substantially addressing shortfalls in the supply of animal feed and eventually creating a USD2 billion a year industry on the continent. Of course, safe and hygienic processing standards will need to be promoted among processors and users to allay safety, storability and other concerns. CGIAR scientists believe related research and development activities could facilitate about 20% of the sector’s potential transformation, so that further scaling could rely on private, and not donor, funding. The innovation was developed by the International Livestock Research Institute (ILRI), International Institute of Tropical Agriculture (IITA) and International Potato Center (CIP), with the support of CGIAR Research Programs on Root Tubers and Bananas (RTB), Integrated Systems for the Humid Tropics and Livestock and Fish, as well as the Global Cassava Partnership for the 21st Century (GCP21). Working closely with private sector partners, ILRI is currently leading the effort to attract USD25 million investment into the further development of the sector in four Africa countries. If successful, the CGIAR partners believe they could substantially help address shortfalls in the supply of animal feed and eventually facilitate the creation of a USD2 billion a year industry. Tags: Cassava, CIP, GFIA, HUMIDTROPICS, IITA, Nigeria, RTB. Bookmark the permalink. I took time to view the a 6 minutes video message “transforming cassava peels into animal feed” I commend your good work.